In the United States, a state is a political entity. There are currently 50 of them, and they are bound together in a political union. Each has a government and can make laws over a particular area that the state covers. All states have a shared sovereignty with the U.S. federal government. People who live in states are citizens of both the United States and the state they are in. People can move between states without asking or saying so, unless a court has said they can't. Four states call themselves "commonwealths" in their official names. Washington, D.C. is a federal district and not a state nor in a state. States divide their territory into counties, or something similar with different name, which are not sovereign. Most states give their counties some government authority; a few states give them none. State governments get their power from the people of that state. 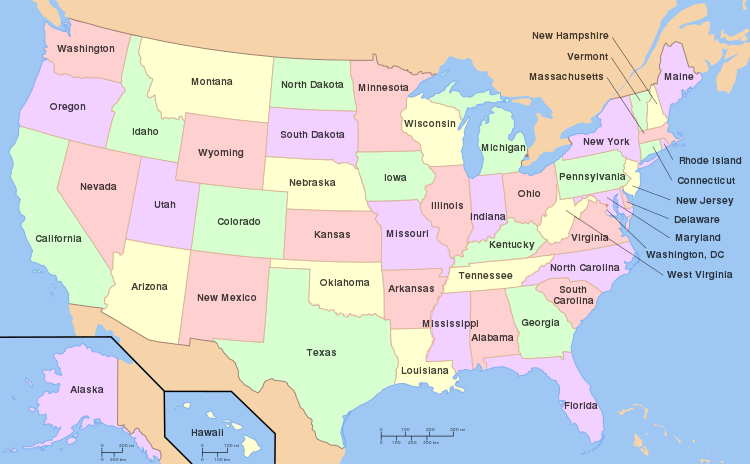 States have a number of States' rights under the United States Constitution. States and the people that live in them are represented in the United States Congress in both the Senate and House of Representatives. Each state also selects electors (an equal number to the number of Senators and Representatives from that state) to vote in the Electoral College, which elects the President of the United States. ↑ Erler, Edward. "Essays on Amendment XIV: Citizenship". The Heritage Foundation. Archived from the original on July 24, 2017. Retrieved January 12, 2016.